March 18, 2017 - No Comments! Hello friends v2.2.3 hotfix addresses some bugs that were found immediately after the release. 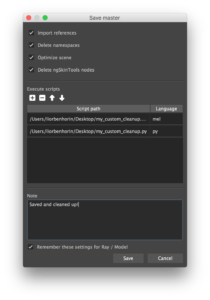 that will allow running .py or .mel script during publishing of master, as well as scene clean up. The setting and scripts can be remembered per component.